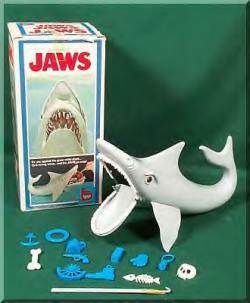 I absolutely LOVED this game from Ideal...Jaws. It rode the wave of "Jaws" movie fame and although the movie was too grown-up for me, the game wasn't. You got a plastic shark with open jaws and a bunch of plastic trash in his mouth, including a bone. You used a little plastic hook to get the trash out and eventually it snapped shut...if you were wielding the hook at that time, you lost. Kinda like "Operation" or something...encouraging a light touch. I've heard from more than one person who put their Barbies in the shark's mouth though for a little more creative play. The wonderful Plaid Stallions site confirms that, with one reader commenting: "I'll bet that nearly 100% of the sharks turned from game to supervillian in the end." The human bone was the best bit of trash, by the way. Did you have it? Anyone enjoy it as much as me? I had this and completely forgot about it! It was great! I had this game--but secondhand and did not have the fishing poles. So I would get the items out of his mouth by hand. Well, this would never get sold today, because man did it hurt when his jaws snapped shut! Yes! Oh, vivid memories. I had this about the same time I had my beloved Cat's Eye game. Jaws was the bomb! I have vague memories of the tv commercial too.